If you are a salmon lover and are looking for a new way to serve it to your family, I have an amazing recipe for you today. Are you familiar with American Spoon Foods? It is sort of a foodie lovers dream. They have all sorts of jams, preservers and grilling sauces available. The only downside is the price. Our favorite item to buy was the Apple Cider Grilling Sauce, but at almost $10 a jar, the price was just not reasonable. My mom has been perfecting her own Apple Cider Grilling Sauce copycat recipe for some time now and she has finally done it. Compared to the packaged sauce that we had bought in the past, we think our version has much more flavor and tastes amazing. The main flavors we have are apple, spices and onions. You may wonder why we didn't use an actual apple cider in the recipe. This is because the concentrate and the old bay seasoning provide the spices you would normally have in an apple cider, plus a little bit extra like celery seed. One ingredient that some cooks may not have on hand is the Fox Point Seasoning made by Penzeys. If you are wondering what to sub for this, it is a mixture of freeze dried shallots, chives and scallions. 1. Add 2/3 of the concentrate to a sauce pot. Add dried onion, seasonings, apple cider vinegar and brown sugar. Simmer 3 minutes. 2. Combine the thickener ingredients together. Add to the apple glaze, stir and simmer for 4-5 minutes. If the mixture is too thick, add 1-2 tsp. of water to thin it out. When you are ready to cook the salmon, you can either cook the fish most of the way in the oven and add the glaze towards the end of the baking process, or you can glaze it once at the start and once more midway through. Whatever you feel like! We just glaze it once and that works fine for us. As always, just be careful not to over cook your fish. 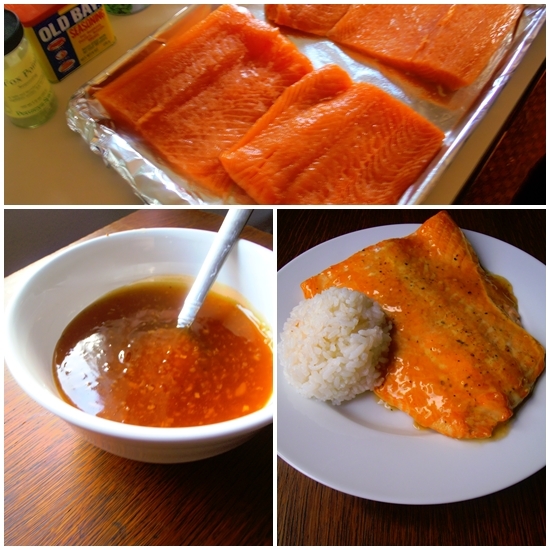 This sounds like a wonderful glaze for salmon! So cool that your mom could copy the expensive one! Looks delicious! Happy to see you back blogging! Yummers! Happy to see you back, hope to see more of you!!! Just went to order the one from American Spoon Food and saw the shipping charge...more then the product!. Thanks, will try the recipe. How do you bake the salmon? Like at what temp and for how long?